1999 a seedling by Ārsis Auders, Latvia. Auders text. Kompakts lēni augošs krūms bez centrālā līdera. Radiāli izvietotas skujas ir zilgani zaļas ar vīna sarkaniem jauniem pieaugumiem pavasarī. Desmit gados 1,5 x 0,8 m. Atrasts 1999. gadā starp sējeņiem. Aris Auders, Latvija. Bright blue needles on this upright, semi-dwarf selection of this rare spruce from China are really brilliant. The way they twist slightly around the stem distinguishes this from the much more common Picea pungens cultivars. Growth Rate: 4-8" HxW@10yrs: 7'x3'. Brent Markus text. A medium-size upright coniferous tree with gray-blue needles. Forms a broad pyramid eventually. Prefers full sun in well-drained soil. 8' tall x 3' wide in 10 years. Hardy to -20 degrees. USDA zone 5. Discovered and introduced by the Flora Wonder(tm) Collection of Buchholz Nursery. Buchholz text. An upright, pyramidal spruce that is fairly fast-growing. This variety has a more dense form and is apparently hardier than the species, being named for the Morton Arboretum which is Zone 5. Brent Markus text. female cones in one phase. Rendkívül ritka jelenséget mutat a fajta, hím és nőivarú virágai egy száron együtt ülnek. A tobozvirág felső része kis tobozt hoz, míg az alsó része poroz. Ezüstös színű testes és erőteljes növény. Szikár, karcsú és ezüstös, mint névadója. P. hirtella Rehd. & Wils. P. alcoquiana /Veitch & Lindl./Carr. Dense, more uniform upright spruce with bicolor needles. The most colorful of all bicolors, this selection boasts needles with bright, silver-blue undersides, green tops and a tint of yellow on the most exposed surfaces. A flat-topped bush when young, it eventually develops into a pyramidal tree, or you can maintain its flat form by removing upward shoots that start from rose-purple buds. Iseli text. Leaves are bicolor, green and blue with some yellow overcast in winter. Dwarf plant getting not much over 10 ft. its whole life time. Introduced around 1985 Vermeulen Nursery. Stanley text. A form that shows needle tops and bottoms from all angles making it bicolor. Tops of needles are green, undersides are silver-blue - both colors show at once. Has reddish-purple cones even at a young age. Grows in a spreading nest form, but can become somewhat upright as it matures. Growth Rate: 6-9" HxW@10yrs: 3'x5'. Brent Markus text. A dwarf spreading evergreen conifer with short blue-green needles. Forms a dense mounding plant. Prefers full sun in well-drained soil. 10" tall x 2' wide in 10 years. Hardy to -30 degrees. USDA zone 4. Buchholz text. A slow-growing upright coniferous tree with rich emerald-green needles. Branches ascend to form a broad, dense pyramid. Prefers full sun in well-drained soil. 5' tall x 2.5' wide in 10 years. Hardy to -20 degrees. USDA zone 5. Discovered and introduced by the Flora Wonder(tm) Collection of Buchholz Nursery. Buchholz text. A slow-growing evergreen conifer with a broadly-pyramidal form. Branchlets droop downward, giving a weeping appearance. New growth in spring is light gold. Prefers sun/partial shade in well-drained soil. 5' tall x 3' wide in 10 years. Hardy to -20 degrees. USDA zone 5. Buchholz text. Short, dark-green needles are held closely to the branches of this compact spruce, the undersides of which have a silvery-blue somatal banding. A tidy dwarf, originating from Germany. Growth Rate: 2-4" HxW@10yrs: 3.5'x2.5'. Brent Markus text. This pyramidal spruce has long, widely-spaced needles that are two-tone blue and green. The drooping branches give it a graceful appearance, and its dwarf growth habit gives it a dense habit. Introduced by Wells Nursery, Mt. Vernon, WA. Brent Markus text. A slow-growing evergreen conifer with a broad pyramidal form. Branchlets droop downward, imparting a "weeping" look. Foliage is blue-green. Very graceful. Prefers full sun in well-drained soil. 8' tall x 4' wide in 10 years. Hardy to -20 degrees. USDA zone 5. Buchholz text. A dwarf form of Brewer's Weeping Spruce. Plant has blue and green leaves on a globe shape plant. No part of the plant resembles a weeping plant. This plant at some time was called 'WB'. Found around 1978 in Germany. Stanley text. Found as a broom, 4” diameter, average, near Alpine fir # 2.
power plant across the east above the cliff. Long, steep climb. A dense form of Englemann Spruce found by Paul Warnick at the University of Idaho Arboretum. It has an appearance similar to the Colorado Spruce known as ‘Fat Albert’. Howse text. A unique, sparsely-branched tree with blue needles and an irregular, pyramidal form. Found by Mike & Cheryl Davison. Brent Markus text. Found as a broom in Colorado. old, short growth. JM text. small broom, 50 yds west of 2nd cabin, near Berthoud Falls. Found as a broom, below Berthoud Falls. JM text. This spruce grows into a dense pyramid shape with bright blue color. Needles are quite long, giving a soft, elegant texture to this conifer. Growth Rate: 4-6" HxW@10yrs: 6'x3'. Brent Markus text. A striking upright coniferous tree with short, gray-blue needles. New growth in spring droops giving this selection a lovely "weeping" look. Tiny red cones in spring mature to dark brown by summer. Prefers full sun in well-drained soil. 6' tall x 4' wide in 10 years. Hardy to -60 degrees. USDA zone 1. Discovered and introduced by the Flora Wonder(tm) Collection of Buchholz Nursery. Buchholz text. A slow-growing evergreen conifer with a dense, broadly-pyramidal form. Light blue foliage is rather soft, as the name implies. Nice in the winter garden. Prefers full sun in well-drained soil. 3' tall x 2' wide in 10 years. Hardy to -60 degrees. USDA zone 1. Buchholz text. bridge, east of Vail, collect from bridge. Larry Stanley only. Bristlecone Levi Alone. JM text. maybe large dwarf, on road above Alma, Colorado. JM text. Found as a broom, burl broom combo, plant is very tight and dwarf looking, burl is almost all around trunk is 12”. Growth sprouts occur all around burl and many die as well others grow to reasonable size – 6-10” – with growth of 1” per year. It appears this sprout growth is followed by burl growth where ever into sprouts grow best. Squaw Pass at Saddle, 8’ up. JM text. Pass on Saddle. JM text. A weeping evergreen conifer with light powder-blue needles. A graceful and glowing presence in the landscape. Prefers full sun in well-drained soil. 6' tall x 4' wide in 10 years. Hardy to -60 degrees. USDA zone 1. Buchholz text. A vigorous evergreen conifer with a pyramidal form. Foliage is green. Selected for extra large cones which are red in spring. Prefers full sun in well-drained soil. 10' tall x 5' wide in 10 years. Hardy to -60 degrees. USDA zone 1. Buchholz text. Found as a broom, 24” x 24”, 20’ up, tight, blueish, on Mt. Evans road on west, below Echo Lake. Randy Dykstra find. JM text. of Limber Grove. JM text. of the hiway # 666 in Arizona. JM text. A beautiful dwarf spruce with powdery gray-blue foliage. An excellent slow-growing variety ideal for a rock garden. Growth Rate: 1-2" HxW@10yrs: 1'x1'. Brent Markus text. A dwarf, dense, upright evergreen conifer with gray-blue needles. Forms an attractive blue pillar in the landscape. Prefers full sun in well-drained soil. 3' tall x 1.5' wide in 10 years. Hardy to -60 degrees. USDA zone 1. Buchholz text. A dwarf conical upright growing 4-6 inches a year. Leaves are blue on a compact plant. Mature plant will reach 6 ft. Stanley text. Found as a broom, 24” x 24”, tight, next to Alma water works. before to Cedar City. JM text. east of Dazzie. JM text. south of Alma, across from Betwixt. JM text. Found as a tree, on way to Limber Grove. JM text. at Eagles Eyrie. JM text. side about 200 yds, south of road on left side going south. tight, vigorous, 5’ x 5’. JM text. Guanella Pass road above power company dam at left. JM text. Found as a hanging seedling on Flat Tops Plateau, naming later. Found as a tree, Mt. Evans, past big corner. JM text. Found as a broom, Mt. Evans Road on 1-20 2004. JM text. healthy, typical, about Frisco, about 2 curves on east side. Aged experimental organic wild find of Nate Cassell. A dwarf evergreen conifer with a dense conical shape. Short needles are gray blue-green and taper at branch tips. Prefers full sun in well-drained soil. 30" tall x 20" wide in 10 years. Hardy to -60 degrees. USDA zone 1. Buchholz text. A slow-growing evergreen conifer with a dense pyramidal form. Needles are light blue. A nice landscape plant, especially adding color to the winter landscape. Prefers full sun in well-drained soil. 8' tall x 4' wide in 10 years. Hardy to -60 degrees. USDA zone 1. Buchholz text. thick, on corner of Squaw Pass. JM text. from south, just before Dike, near top of pass, across creek. Large and high on top of tree. JM text. down from top of Guanela Pass & toward Grant. JM text. Found as a broom, Mt. Evans Road on 1-20 2004 by Franzi 66.
to 2nd switchback. JM text. route past Limber Grove. JM text. A dwarf dense evergreen conifer with short blue needles. Somewhat irregular in form, and often as wide as tall. Prefers full sun in well-drained soil. 2' tall x 2' wide in 10 years. Hardy to -60 degrees. USDA zone 1. Buchholz text. Softer in color and in needle texture than dwarf Picea pungens cultivars, this compact, globose spruce traces its roots to a species native to the Rocky Mountains. Rarely seen in the trade, the muted, blue-green conifer thrives in cool, mountain conditions, so its subtle, rugged beauty makes a perfect addition to the alpine garden. Iseli text. ’Geneva’) about 50 yds, a little lower on hill. JM text. blue, 3x3’, 25’ up, Squaw Pass west of Burl. JM text. of Betwixt on left. JM text. A blue dwarf form of Engelmann Spruce. This plant is from the Jerry Morris Rocky Mountain Collection. Very small plant with blue leaves. Good for trough or rock gardens. Stanley text. Found as a broom, 4’, tight, green. JM text. A natural blue dwarf globe of seed of the Engelmann spruce. Természetes kék törpe gömb magról, 1 m 25 évesen. Mesterházy Zsolt 1983-ban vásárolt 100 g Picea engelmannii magot a holland Den Ouden cégtől, amelynek magoncaiból több különösen intenzív kék színt mutatott, meghaladván a Picea engelmannii átlagos lehetőségeit. A három jelölt – bár nem tipikus törpe növény – 26 év után sem haladja meg az 1 métert. Habitusuk némileg eltérő. A Nefertiti piramisra emlékeztetően szabályos szerkezetű, a Vízcsepp viszont rövid szártagú vezérhajtásai miatt alul kiszélesedő habitust vett fel. A Golyó a Mogyoródi úti kertészeti szakiskola gyűjteményébe került ’Labda’ néven, ez egy szép gömb alakú növény. Mindhárom szelekció hihetetlen tűrőképességű, helyenként bíborba hajló kék alaptónusú luccá fejlődött. A növényeket a kiültetésig Orlóci László nevelte konténerben. A dwarf blue pyramid for Queen Nefertiti, 1 m in 25 years. 1 m in 25 years. Lilásban játszó kékes vízcsepp, 1 m 25 évesen. difficult to get wood, on east end of Vail, on south side of I-70. White River to east. JM text. A closed blue conical beaty with hopeful future. Zárt kék kúpos szépség reményteljes jövővel. tree, 80 years old in 1997. Harper text. Probably the same as /Noland/ ? Lodge Pole by Pinkham. JM text. I caught sight of this spectacularly weeping Engelmann spruce from the highway in northern Washington. It was standing alone in a field, so it really stood out. I am guessing that whomever cleared the trees in that field noticed this unusual tree and spared it. Griffith text. yds, large green, round, 4’-5’ diameter. JM text. A curious upright evergreen conifer with whip-cord branching. No two trees look alike. Needles are a dark blue-green. Prefers full sun in well-drained soil. 7' tall x 2' wide in 10 years. Hardy to -60 degrees. USDA zone 1. Buchholz text. Berthoud Pass on right above Berthoud Falls. JM text. A dwarf form of Engelmann Spruce. This plant is part of The Jerry Morris Rocky Mountain Collection. Very tight broom with very short needles. Plant was found west of Denver. Leaves are green. Stanley text. big curve corner ½ mile or so on the Squaw Pass. JM text. curve where parking yard. JM text. side of Berthoud Pass. JM text. Plant is a part of the Jerry Morris Rocky Mountain Collection. Conical upright. Grows 2-4 inches a year with blue leaves. Stanley text. 100 yds north of north traffic light on east at Breckenridge. Found as a Nutans type hanging seedling on Flat Tops Plateau CO. Branches are turning by time to the ground, a possible columnar shape for the future. Mesterházy text. This dense, globose spruce has a wonderful gray-blue color. Short needles and a compact habit make it a delightful rock garden plant. An uncommonly-seen variety! Growth Rate: 0.5-1" HxW@10yrs: 10"x10". Brent Markus text. This compact Engelmann spruce has bright blue foliage and prominent orange-brown buds. It will form a wide disc shape as it matures, giving it a delightful shape and color, fitting even in smaller gardens. Brent Markus text. On Squaw Pass next to road on going up. JM text. nice, across from Trout Lake on Lizardhead Pass. JM text. Found as a broom, tight, different, on Squaw Pass road. JM text. growth, dark green, a tree base accross Lil Sister. JM text. A dense upright evergreen conifer with gray-blue needles. Rich brown, shiny ovoid buds are attractive in the winter landscape. Prefers full sun in well-drained soil. 7' tall x 4' wide in 10 years. Hardy to -60 degrees. USDA zone 1. Buchholz text. A very light blue upright medium growing Engleman Spruce. Some what compact and has a central leader. Found by Pete Vanderwolf for color. Stanley text. broom blue, by Jerry’s road to cabin, Waldorf. JM text. bank of road going east past Jerry road, Waldorf. JM text. special, Squaw Pass – up road to gate – uphill. JM text. down the west side of Weston Pass. JM text. very close to road. JM text. A brand new witches broom found by Doug Wilson in Wilson Park, Salem, Oregon. Doug brought us this broom to graft in March 2012. It was collected by Wilber Bluhm, Brian Jacob, Dean Wentworth and Doug Wilson - all men very active in the American Conifer Society. From what we have seen it is a very tight Engelmann Spruce with bluish-green foliage. Brent Silver-blue foliage on this tight spruce is accented by the large orange buds. This cultivar was found as a witch's broom by Doug Wilson at Willson Park in Salem. Growth Rate: 0.5-1" HxW@10yrs: 10"x10". Brent Markus text. Picea farreri - Burman Spruce or Farrer Spruce. Native of Burma. Discovered in 1980. Consistently occurs at lower altitude than its ally Picea brachytyla. Picea farreri is restricted to western Yunnan and far north eastern Burma and possibly getting into extreme north eastern India and adjacent Tibet. Prefers a moist site. A tree up to 30 metres in native habitat. 1.8 metres high x 2 metres wide at base in 6 years in our Nursery/Garden. Zone 8. Cedar Lodge text. P. abies ssp. fennica /Regel/Parf. P. alba albertiana /S. Brown/Beissn. A snake like White Spruce. Leaves close to stem and blue-grey. Stems go all which way. Stanley text. A miniature form of Alberta Spruce. Looks just like a Chocolate Kiss. The plant is a squatty conical plant that grows 1/2 inch a year. Introduced by Grootendorst of Holland. Found about 1968. Stanley text. Alberta Globe Sport Tiny Hort. Picea glauca 'Albertiana Conica' - Formerly known as Picea glauca 'Conica'. Found wild in Canada. First class rockery and garden subject. Compact, erect-growing garden gem. In mild, humid, shady situations it is prone to attack by mites. (This is the case with many Picea). These can be easily controlled by spraying. 80 cm high x 40 cm wide in 10 years in our Nursery/Garden. Zone 2. Cedar Lodge text. motherplant dead 1989. Harper text. Found as a witch's broom in Alsester, South Dakota. An incredibly dense, bright blue globe! Brent Markus text. An upright dwarf evergreen conifer with arching branches. Forms a dense mound. Needles are gray-blue. Prefers full sun in well-drained soil. If staked, 6' tall x 4' wide in 10 years. Hardy to -60 degrees. USDA zone 1. Buchholz text. An evergreen conifer with a dense pyramidal form. Short needles are light blue. Arose as a mutation on Picea glauca 'Arneson's Blue'. Prefers full sun in well-drained soil. 6' tall x 3' wide in 10 years. Hardy to -60 degrees. USDA zone 1. Buchholz text. A dwarf evergreen conifer with a dense conical form. Foliage is bright blue, although some patches of green can occur. Nice in the winter landscape. Prefers full sun in well-drained soil. 4' tall x 2' wide in 10 years. Hardy to -40 degrees. USDA zone 3. Buchholz text. A dwarf blue variety of Alberta Spruce. Leaves are very light aqua blue. Plant grows in a dwarf conical habit like a regular Alberta Spruce. Does throw some green leaves. Plant grows 2-4 inches a year. Found by Arensons Nursery Canby, Oregon. Stanley text. A /Conica/ rügymutációjaként keletkezett változat. A dwarf form of White Spruce. Form on plant is like an upright beehive with blue-grey foliage. Plant grows about 1 1/2 inches a year. Stanley text. A miniature dense evergreen conifer with extremely short gray-blue needles. Forms a ground-hugging bush. Prefers full sun in well-drained soil. 8" tall x 12" wide in 10 years. Hardy to -60 degrees. USDA zone 1. Buchholz text. Found by Bill Barger (U.S.) in January 2013 during a witches’ broom expedition. The original witches’ broom had a very nice blue colour. Edwin Smits text. Found in Weldon Delp Nursery, Harrisville, Pennsylvania. A spreading or flat-topped shrub with bright, blue-green needles. A recent introduction. Brent Markus text. 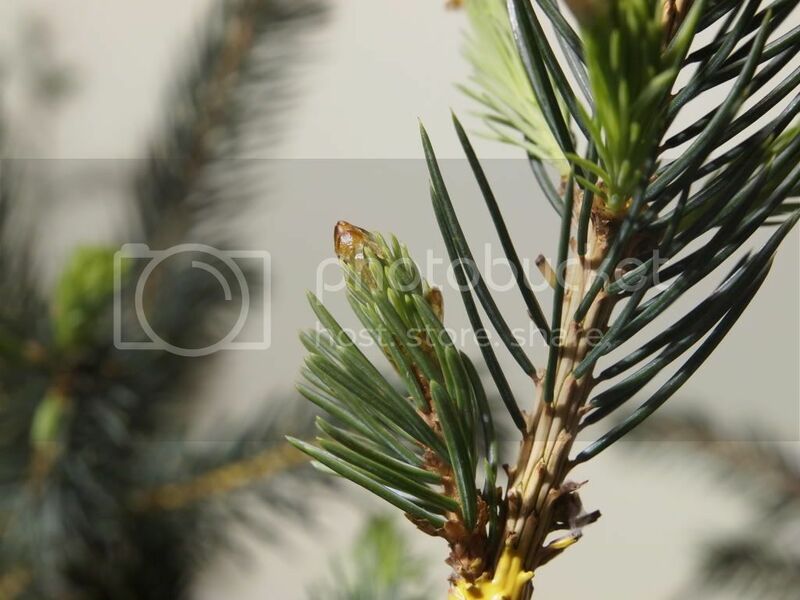 A miniature evergreen conifer with dark blue-green needles. Forms a dense round plant. Tiny light-colored buds dot the foliage ornamentally. Prefers full sun in well-drained soil. 8" tall x 8" wide in 10 years. Hardy to -60 degrees. USDA zone 1. Buchholz text. A miniature Alberta Spruce. Just a tight compact ball. Leaves very very small with little buds and steel-blue foliage. Plant 6 inches in 10 years. Three year old plants the size of a quarter. Rare ! Found in Germany as a sport of `Echiniformis Glauca'. Stanley text. A broad pyramid with blue-green needles. Very small needles and dense branching produces a very tight attractive form. Excellent hardiness. Was found at Coenosium Gardens when they were located in Aurora, Oregon (Mitsch Nursery) as a sport on a Picea mariana 'Nana.' Also incorrectly known as 'Blue Tear Drop.' Growth Rate: 3-6" HxW@10yrs: 4'x2.5'. Brent Markus text. An improved selection with striking gray-blue needles and dense cone shape. Does not tend to revert back to green foliage like other cultivars tend to. A standout in any garden, this conifer is excellent in rock gardens, containers framing a doorway, or planted in the landscape as a single specimen or multiple grouping. Full to partial sun. Slow growing evergreen 6 feet tall and 2 1/2 feet wide. Monrovia Nurs. text in ACS database. grey-green needles. Rich Eyre text. destroyed in 1986. Stupka text. An upright evergreen conifer with a narrow weeping form. Short needles are blue-green. Selected by G. Williams in the wilds of Nova Scotia. Prefers full sun in well-drained soil. 7' tall x 3' wide in 10 years. Hardy to -60 degrees. USDA zone 1. Buchholz text. Cecilia - "Was named 'Skippack Hwy.' Renamed after Joel Spingarn's first wife.' Greg Williams text. A dwarf dense evergreen conifer with gray-blue needles. Forms a rounded habit, eventually more tall than wide. Prefers full sun in well-drained soil. 3' tall x 3' wide in 10 years. Hardy to -60 degrees. USDA zone 1. Buchholz text. A blue dwarf spreading White Spruce. Leaves are silvery-blue on a flat spreading plant. Plant was found by Greg Williams. Plant was introduced by Spingarn of Baldwin, NY. Stanley text. and height, compact, blue. Harper text. Found on the Cleveland Road in Clinton IA USA. Herbst text. A dwarf upright evergreen conifer with short silver-blue needles. Tiny light brown cones can adorn this selection. Prefers full sun in well-drained soil. 6' tall x 3' wide in 10 years. Hardy to -60 degrees. USDA zone 1. Buchholz text. A dwarf evergreen conifer with a dense pyramidal form. Foliage is gray blue-green. Makes a plump specimen at maturity. Prefers full sun in well-drained soil. 7' tall x 4' wide in 10 years. Hardy to -60 degrees. USDA zone 1. Buchholz text. The classic Dwarf Alberta Spruce may well be the most popular, familiar, dwarf conifer in cultivation. It grows slowly into a perfectly conical, small tree with a thick coating of fine, green needles. Its perfect form, compact growth and dense foliage make it ideal for entry, container and landscape. It responds well to shearing and shaping for topiary too. Found at Lake Leggan, Alberta, Canada, by Prof. J.G. Jack and Alfred Rehder of the Arnold Arboretum in 1904, it appreciates consistent moisture, good nutrition and an occasional blast from the garden hose during summer to increase pest resistance. Iseli text. P. glauca var. albertiana f. conica Rehd. Místo nálezu, Bydžovská Lhotka. Čarověník na Picea glauca Conica, barva zelená, jehlice 1cm, pěkný kopaktní. Podobná jako cv. Sport. Balatka text. Found as a variegated mutation in Bydžovská Lhotka. Místo nálezu, Bydžovská Lhotka. Pupenová mutace z klasické Picea glauca Conica, barva žlutovariegátní, jehlice 1 cm. Balatka text. A selection by Ken Marek of Adrian Michigan. Found as a reversion on a slow-growing cultivar with a second flush of golden-yellow foliage in summer, Picea glauca ‘Rainbow’s End’. Growth Rate: 4-6". Brent Markus text. Sport of a Picea glauca var. albertiana ‘Conica’ branch mutation, similar to ‘Laurin’. It was imported unnamed by the Jac Schoemaker Nursery from Boskoop. He also gave the name to this cultivar. Edwin Smits text. A miniature variety of Alberta Spruce. Plant grows one inch a year in a mound shape with green leaves. Leaves are coarser than regular conica. Looks better in ground, tight and nice, then in pot, loose looking. Better off in rock garden than in trough. Stanley text. Een mutant van P. g. 'Conica' gevonden in 1979 door L. Jeurisen-Wijnen, België, en in 1996 door dezelfde persoon geïntroduceerd. Kegelvormige dwerg. In 10 jaar ± 80 cm. hoog. Het nieuwe schot groeit uit van botergeel naar witgeel om tenslotte groen te verkleuren, een kleurenpracht die ± 6 weken duurt. Hulsdonk text. A dwarf variety of Alberta Spruce that flushes white new foliage in spring. Leaves a bright clear white in spring turning later to green. Grows 2 inches a year. Very nice plant for that small conifer garden. Stanley text. This marvelous new selection from Oregon Pride Nursery has silver-blue foliage. Its upright form and exceptionally bright-blue color make it an excellent vertical accent plant. This has been listed incorrectly as Picea orientalis ‘Deer Run’ because the needles are blunt it looks very similar to orientalis, but we have definitely identified it as Picea glauca ‘Deer Run’. Markus text. narrow upright form. Stupka text. Dense global selection. Young shoots bright yellow till summer. Arose as a spontaneous mutation of the 'Alberta Globe'. Skórka text. Odmiana licencjonowana, o kulistej i gęstej koronie. Młode przyrosty jasnożółte, latem zieleniejące. Powstała jako spontaniczna mutacja na 'Alberta Globe'. Wolno rosnąca doskonale prezentuje się szczepiona na pniu. Skórka text. in color." Greg Williams text. Thin, dark-green needles are accented by clusters of orange-brown buds, almost forming fasciations at the branch tips. A nice tight cultivar with a unique growth habit! Growth Rate: 0.5-1" HxW@10yrs: 1'x1'. Brent Markus text. 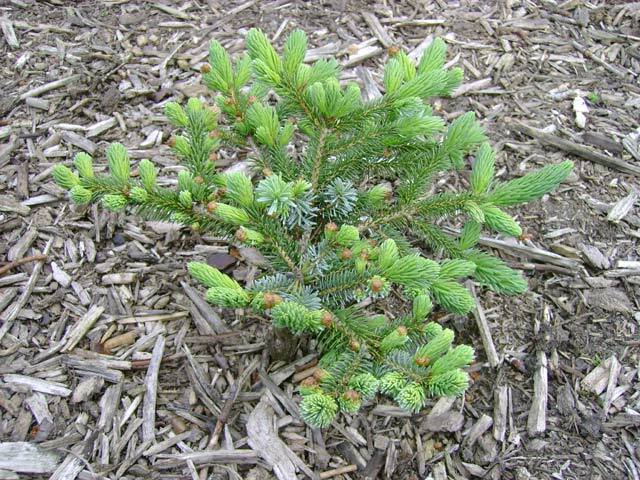 A dwarf spruce found by Rob Tudehope at a cemetery in Orange City, named "Doc" because that was the nickname of his friend whose burial plot was nearby. Brent Markus text. Found in Hudson NH at a cemetery. Approx 60' up a dying tree I climbed. Rounded in shape. Nice blue/green foliage. Rounded habit. Super tight. Broom acted as a nesting for both birds and squirrels. Named in honor of Dennis Dodge. Fechke text. A dense, globose broom with a light-green color. Found as a witch's broom by Rob Tudehope in Sloan, Iowa. Retrieved on a windy day, causing the cuttings to fall "downwind." Brent Markus text. A new golden variety of Picea glauca found by Josef Braeu right outside a Dairy Queen restaurant! The color is a stunning, deep gold, almost orange in appearance. Part of the Minnesota Broomhuntings since about 2010, organized by Josh Horky and Josef Braeu. Growth Rate: 5-8". Brent Markus text. This broom is only 2 miles from my house and very close to where I grew up! In the early 70s a friend and I saw a great horned owl nest in this tree, at the time I wanted a baby owl. It was early spring and we could see mother owl sitting on eggs. We waited to see the parents feeding the babies, it was time to collect a baby! Now try to picture two ten year old boys with a rope! Up in the tree I went, boy scout back pack to put my new pet in and lower down to my friend! As I got closer to the nest I noticed the nest was green like the tree? Not knowing what a broom was I never gave it a second thought. Back to the owl, as I got close to the nest my friend was yelling DUCK! I was not concerned with ducks at this time because I had mother owl swoopping down on me! still he kept yelling DUCK!LOL! Needless to say it was time to get the heck out there, no baby owl! 42 years later I bring to you Picea glauca' Duck'. Now the once tight ball like broom is dying/rotting from the center! I am glad I got to it before it died! Rob Tudehope text. Light green foliage on this dwarf spruce is a nice combination of soft new growth and stiff older foliage. A unique find. Growth Rate: 2-4" HxW@10yrs: 3'x3'. Brent Markus text. Irregular rounded form from a witches' broom. Rich Eyre text. Picea glauca 'Echiniformis' - Developed in France. Originated from Witches-broom. Common in cultivation now. Appealing blue-grey colour. A dwarf form very slow growing. A very lovely plant. 20 cm high x 30 cm wide in 10 years in our Nursery/Garden. Zone 2. Cedar Lodge text. P. alba var. echiniformis Carr. Rich, bright blue foliage gives this low-growing dwarf spruce a wonderful coloration year-round. It was found as a witch's broom in the upper midwest by Josef Braeu and Josh Horky. Part of the Minnesota Broomhuntings since about 2010, organized by Josh Horky and Josef Braeu. Growth Rate: 1-3" HxW@10yrs: 1'x1.5'. Brent Markus text. This Alberta-type gem grows extremely slowly and forms a dense globe with short, fine needles that emerge blue-green in spring. Ideal for rock garden, trough or miniature railroad. A witch's broom found on Picea glauca 'Conica'. Iseli text. A new weeping variety of White Spruce found by Edwin Smits. Seems to have an irregular, pendulous form with blue-green foliage. Brent Markus text. listed as 'Girard's Dwarf'. Rich Eyre text. Found as a broom of ’Conica’, growth rate a year over 3 cm. Vzrůst strnule kuželovitý s ročními přírůstky 3-5 cm. Jehlice v barvě šedo zelené a dlouhé 8-10 mm. Mutace P. glauca ‘Conica’. Pochází ze školek Žehušice. Čaroveník, skupina výpĕstků podle ročního přírůstku nad 3 cm. Balatka text. A columnar, miniature, variety of White Spruce. Very small needles on very small growth. Very fastigiata form that can be only 24 inches high in 16 years. Found by William Goddard in Vancouver B.C. Canada. Stanley text. A dwarf, upright conifer with dazzling summer golden coloration on the new growth. Perfect to show off in a special garden setting. Prefers full sun in well-drained soil. 4' tall x 2' wide in 10 years. Hardy to -40 degrees. USDA zone 3. Buchholz text. When most conifers have faded to a softer summer color, this dwarf Alberta spruce puts on a second flush of golden growth that brightens up the scene. The slow-growing, narrow cone gets its best color in full sun. Brent Markus text. An upright evergreen conifer with light golden foliage. Can take full sun without burning; nice in the winter landscape. Prefers full sun in well-drained soil. 6' tall x 3' wide in 10 years. Hardy to -60 degrees. USDA zone 1. Buchholz text. This bright gold selection prefers some sun to maintain its beautiful color. Slow-growing and beautiful gold foliage make this plant an excellent addition to any garden! Brent Markus text. This broom is found in Graceland Cemetery Sioux City, Iowa USA. It is in the same cemetery as ’Duck’. Rob Tudehope text. There are two brooms in that tree, my wife was with that day and had pulled the car around to make my walk shorter. I walk past the car to check the last tree,walked back to the car and looked in the tree above the car and there they were! 'Greenwood' was a very tight ball and ten feet below was 'Woodbury' looked to be a very old broom,bottom and center is pretty much gone. Tudehope text. Found as a WB on ’Daisy’s White’. Found as a broom, growth rate up to 2 cm a year. přírustek 2 cm, jehlice prohnuté. Balatka text. P. alba var. coerula hendersonii Dall. & Jacks. This incredibly dense spruce was found as a witch's broom by Rob Tudehope on a tree on the Hickman's property. Found on the same tree as Picea glauca 'Kennel'. Growth Rate: 1-2". Brent Markus text. growth rate a year over 3 cm. ročního přírůstku nad 3 cm. Balatka text. This short, plump selection of Picea glauca 'Conica' exhibits the same likeability as its namesake, Bilbo Baggins from JRR Tolkien's The Hobbit. Like Baggins, the small, reliable Alberta-type is half-size, well behaved and hard working. Tiny, green needles on upright branches give the globe-shaped young 'Hobbit' charm and contribute to its appeal as it matures into a wide cone. Provide ample moisture for this adaptable cultivar discovered at Iseli Nursery. Iseli text. A slow-growing, dense, upright evergreen conifer with short blue needles. Small pointed cones can be ornamental. Prefers full sun in well-drained soil. 6' tall x 4' wide in 10 years. Hardy to -60 degrees. USDA zone 1. Buchholz text. A bushy pyramid with glaucous short blue foliage. Cones heavily. Brent Markus text. The habit of this extremely dense, Alberta-type plant explains it name: short and plump, kind of egg-shaped, like Humpty Dumpty. With nearly equal base width and height, it forms an almost perfect pyramid that is only two-thirds the size of 'Conica.' Found as a witch's broom and introduced by Iseli Nursery. Iseli text. A miniature evergreen conifer with deep blue green foliage. Grows into the shape of a tiny Alberta Spruce. Delightful in a trough or rock garden. Prefers full sun in well-drained soil. 12" tall x 6" wide in 10 years. Hardy to -60 degrees. USDA zone 1. Buchholz text. Found by Nelis Kools as a temporary light-coloured branch mutation on a Picea glauca var. albertiana ‘Alberta Globe’. Smits text. Pronounced "John's" Dilly, this extraordinary, Alberta-type selection bears the name of dwarf conifer pioneer Jean Iseli. It was named by his brother, Andre', to note the plant's remarkable qualities. Much smaller, denser and slower growing than other Alberta types, its short, fine needles display a distinctive twist during the growing season. Spring growth starts about 3-4 weeks later than 'Conica's. Found at Iseli Nursery in 1981, this signature plant is a fitting choice to honor the co-founder of Iseli Nursery. Iseli text. Jez. Globe Duchac – Duhackove? A weeping spruce found by Josef Braeu and named to honor the late plantsman, John Eustice. Part of the Minnesota Broomhuntings since about 2010, organized by Josh Horky and Josef Braeu. Brent Markus text. growth of ½”-3/4”, beautiful lush green color. Horky text. Short, blue-green needles on this dwarf spruce are very desely-set. It was found as a witch's broom by Josh Horky near a catholic college in Duluth, Minnesota. Part of the Minnesota Broomhuntings since about 2010, organized by Josh Horky and Josef Braeu. Growth Rate: 0.5-1" HxW@10yrs: 8"x10". Brent Markus text. Found as a broom in Calgary, Canada, growth rate over 3 cm. This tiny spruce was found as a witch's broom. It has bright greenish-blue foliage and prominent, orange-brown buds. Brent Markus text. I've done a bunch." Greg Williams text. white areas throughout (zone 2) Fincham text. This slow-growing spruce was found as a witch's broom by Rob Tudehope near a dog kennel. Short, blue-green foliage is surprisingly stiff! Found on the same tree as was Picea glauca 'Hickman'. Growth Rate: 1-2". Brent Markus text. An upright evergreen conifer with deep blue-green needles. Branches arch downward gracefully. Discovered in the wild in Nova Scotia. Prefers full sun in well-drained soil. If staked, 6' tall x 3' wide in 10 years. Hardy to -60 degrees. USDA zone 1. Buchholz text. A miniature form of the common Alberta Spruce. Needles are light green and very short and thin. New from Europe. Prefers full sun in well-drained soil. 2' tall x 1' wide in 10 years. Hardy to -40 degrees. USDA zone 3. Buchholz text. Pinetum. Develops to a little fastigiate plant. This slow-growing spruce was found as a witch's broom by Rob Tudehope in LeMars, Iowa. A squirrel was apparently residing in the original broom because there was a bit of a fight when the broom was being retrieved! Brent Markus text. top of tree. Harper text. Picea glauca ’Lily Backbone’ „At a private residence in Princeton, IL, USA.” Chub Harper notes. Collected by Chub Harper and Randy Dykstra. It’s a very-very slow grower. Dax Herbst text. A golden-yellow spruce that was found growing in the wild by Mike & Cheryl Davison. It grows in a pyramid shape with a growth rate slightly slower than the species. Brent Markus text. motherplant dead 1992. Harper text. Brilliant yellow color is accented by the blue-green color typical of this species. This cultivar was found as a golden branch on a tree near the lions' enclosure at a zoo by Josef Braeu. Part of the Minnesota Broomhuntings since about 2010, organized by Josh Horky and Josef Braeu. Growth Rate: 2-4". Brent Markus text.